The 5km/10km walk starts and finishes at the Exercise Your Moodwalk village at Church Grounds, this is a unique and fun event that will fund vital mental health education programs for The Black Dog Institute. The Church Grounds, our start and end site backs onto the Randwick Pond with views of the Sydney skyline. Winding its way around the Snake Bank jog and continuing along the Grand Drive, the course will take you on a beautiful walk through Centennial Park. 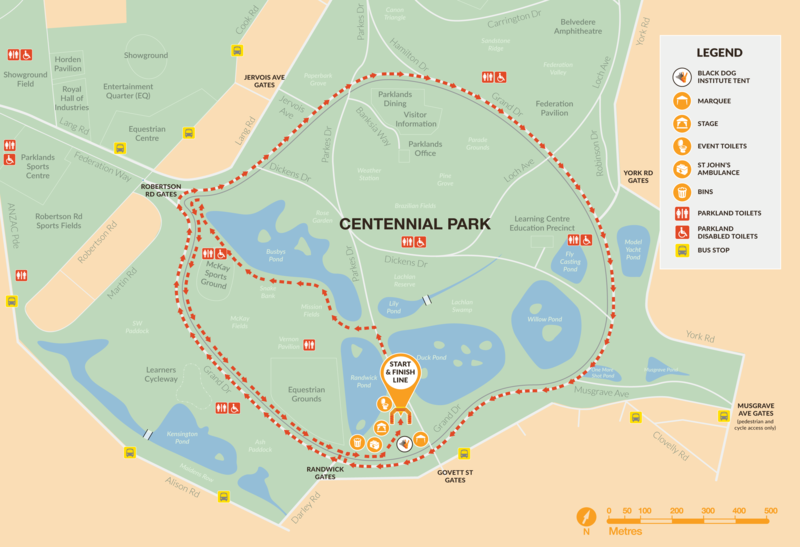 Centennial Park retains its status as a people’s park – it's a spectacular recreational space for adults and children of all ages and is one of the few inner-city parks in the world to offer horse riding facilities. It is also home to diverse flora and fauna and many significant tree plantings, including spectacular Port Jackson figs, Holm oaks and Norfolk Island pines dating back to the early 20th century. Walking the course, with like-minded people, will provide the opportunity to start up a conversation about mental health. Walking side by side, will create a safe place to break down the barriers of stigma and misunderstanding surrounding mental illness, while sharing stories of courage and hope. On reaching the finish line, you will be warmly welcomed and congratulated by wonderful volunteers and team members, and you’ll have the satisfaction of completing the walk and knowing you are helping others.